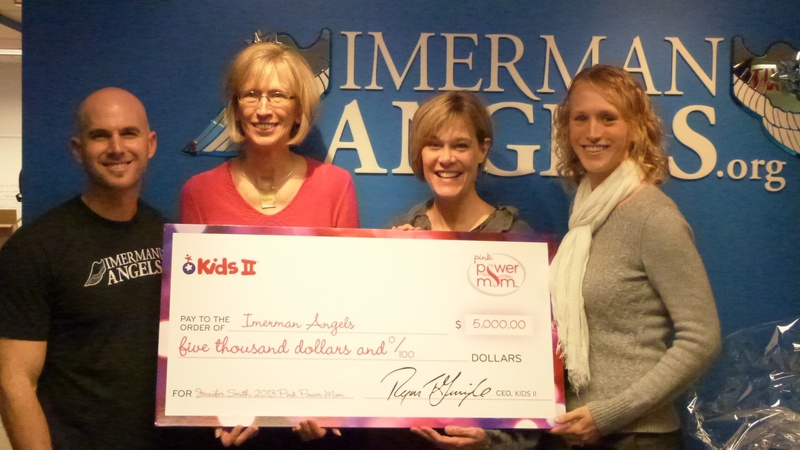 We had an emotional, but joyful day at the Imerman Angels office yesterday, December 3. Long time cancer fighter, mentor angel and dear friend of founder Jonny Imerman, Jennifer Smith, was diagnosed with stage 4 breast cancer at the young age of 30. At the time of her diagnosis, Jen was a new mother to now seven-year-old Corbin. She turned her negative news into a source of deep motivation and began working closely with Imerman Angels. In addition to her work as a mentor angel, Jen mentored young women with breast cancer as a founding member and organizer of the local Champaign-Urbana Affiliate Chapter of the Young Survivor Coalition. Everything Jen was involved with was dedicated to raising breast cancer awareness in young women. Because of Jen’s dedication and strength as a mother and in her fight against breast cancer, Jen was selected as one of eight women to be awarded for her inspiration by the Kids II foundation Pink Power Mom program in 2013. Kids II is a small family owned corporation that creates children’s toys. When they started receiving an overwhelming amount of letters from mothers stating how thankful they were for their products that kept their children occupied during their breast cancer treatment, Kids II took action. Around Mother’s Day every year nominations are sent to the Pink Power Mom program from across the country for courageous mothers who suffer from breast cancer that are making a difference in their community. Each year, the eight winners are flown to Atlanta for a spa weekend and are presented with a check to give to a non-profit of their choice. Earlier this year, Jen’s breast cancer came back strong. She fought hard until the end, but passed away in late September. Yesterday, Heidi Floyd, the Executive Director of Pink Power Mom, Jen’s mother, Nancy Arnold and Jen’s sister Sara joined us at the Imerman Angels office for Jen’s check presentation. 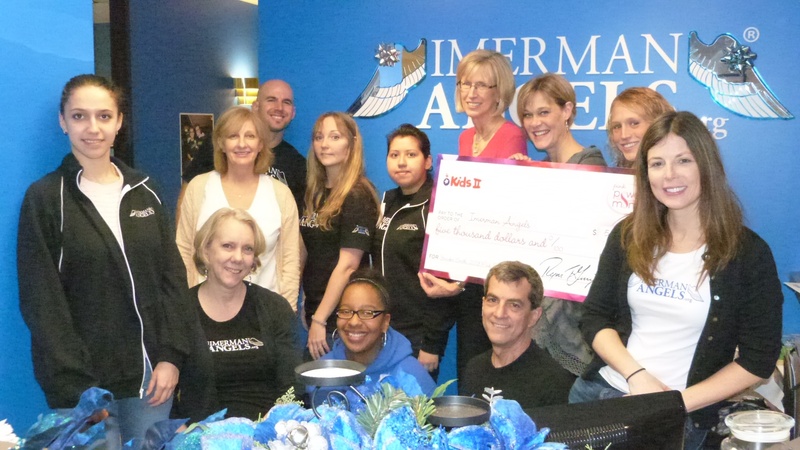 We were all saddened that Jen wasn’t with us, but it was her wish that the donation be made to Imerman Angels. This $5,000 check is the first of five donations, which will be awarded once a year. 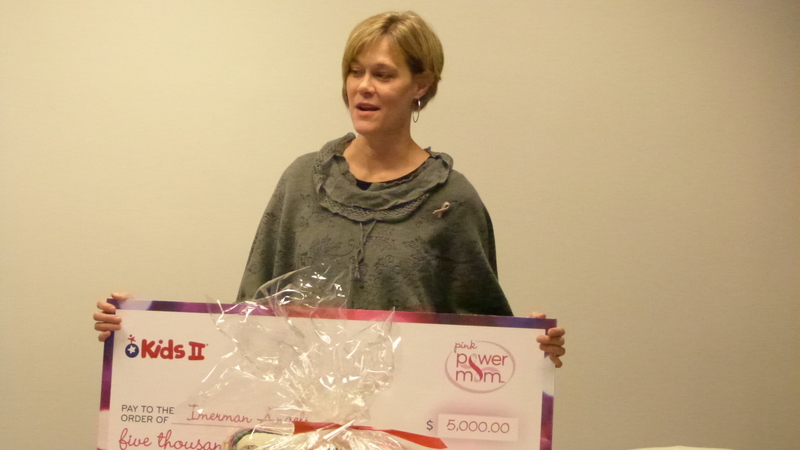 For more information on Pink Power Moms, visit pinkpowermom.com. Seriously the best day- thank you for having me join you- it was an honor to get to spend most the day with them and you. You’re the best and these imgaes are truly beautiful, Shelly! XOXO!